Temperament is extremely important. But so too is being aggressive when it’s time. Learn to take criticism constructively and learn from it. The biggest mistakes they’ve made at Berkshire have been mistakes of omission. Munger “inverts” as he often does and instead of offering tips for a happy life, offers sure fire ways to be miserable, namely – ingest chemicals, envy others, resent others, be unreliable, don’t learn from others mistakes, give up after getting knocked down one, two or three times, do not look at problems backward (do not invert), do not look for evidence that disconfirms your beliefs, don’t aim to minimize objectivity. In a career look for 3 things – don’t sell anything you wouldn’t buy yourself, don’t work for anyone you don’t respect of admire, work only with people you enjoy. It’s much better to let some things go uncompensated – to let life be hard – than to create systems that are easy to cheat. We simply look for no brainers….we’ve succeeded by making the world easy for ourselves, not by solving hard problems. Practical Thought About Practical Thought? Invert, always invert. Many problems cannot be solved thinking forward, you just approach them by thinking backwards. What must you avoid because you don’t want it? “I sought good judgment mostly by collecting instances of bad judgment, then pondering ways to avoid such outcomes.” Invert! 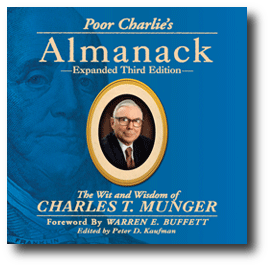 Buffett is the stock picker and Munger is the doubter, the skeptic, the devils advocate, against whom Buffett tests his ideas. What are the factors that really govern the interests involved, rationally considered? (macro and micro-level economic factors? If you want to get smart, the question you have to keep asking is why, why, why? Think forwards and backwards – invert, always invert! If we are unsure about a decision we try to quickly remove any doubt by making an ill-informed, quick decision. Also tend to be maintained in place – previous conclusions, human loyalties, reputational identity, commitments, accepted role in a civilization, etc. Tolerating a little unfairness should be okay if it means a greater fairness for all. The example Munger uses is letting in other drivers on the freeway knowing they will reciprocate in the future. So much of what we do and how we react is driven by envy/jealous but it has become such a taboo that even though it is so ubiquitous, it is rarely talked about and is even left out of most psychology textbooks. Checklists or a set of rules can help with this tendency. The tendency to get extreme consequences when you combine a number of these misjudgments when trying for a particular outcome.